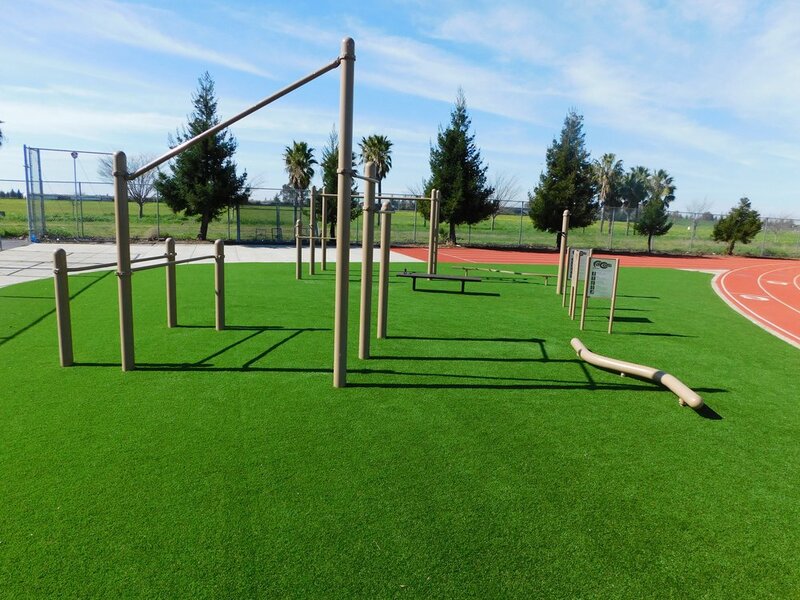 Description: Natomas Middle School transformed their athletic obstacle course from its rubberized surface to synthetic grass over Pour N Play. Background: The client had an obstacle course with a rubberized surface that had failed. There was a large hole in the center of the system which was a safety hazard. The course was out of service due to the wear and tear, but the client did not want to rip out and put in a brand new Pour N Play system in order to utlize the space. Method of Approach: The KYA Group patched and resurfaced the existing Pour N Play then applied artificial turf onto the rubber system. This solution maintains the benefits of the padding while protecting against UV degradation since it is now covered. Artificial turf, while being aesthetically pleasing, is a successful way to avoid replacing an entire playground surface. Results: Natomas Middle School now has a code compliant obstacle course that is beautiful and ready for use. The client was able to maintain both their budget and time line with this successful surface solution utilizing the Wiseburn purchasing contract.